Martha Berry thanks Miss Hayes for remembering her on Mothers' Day. She hopes that Miss Hayes will come to Berry for commencement and the alumni banquet. She says that she has not been feeling well but is looking forward to seeing everyone who visits. 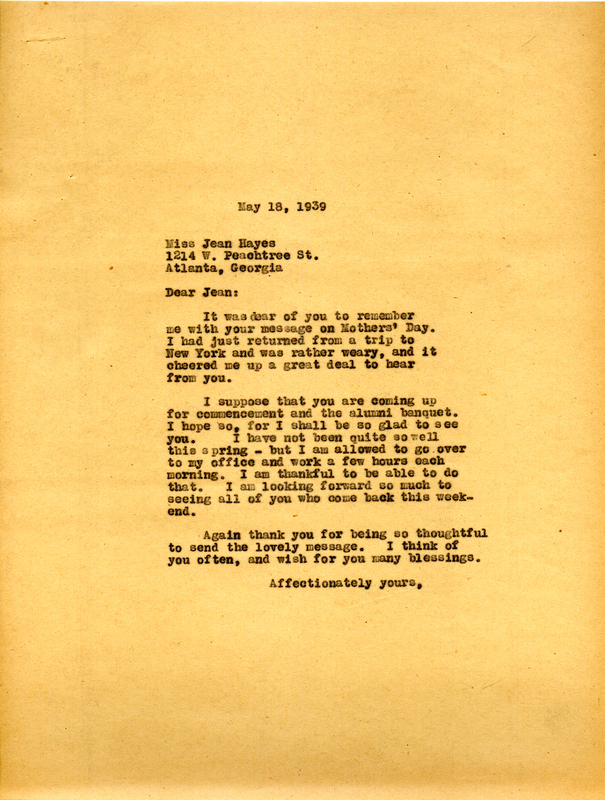 Martha Berry, “Letter to Miss Jean Hayes from Martha Berry.” Martha Berry Digital Archive. Eds. Schlitz, Stephanie A., Cassie LaJeunesse, Jessica Hornbuckle, et al. Mount Berry: Berry College, 2016. accessed April 24, 2019, https://mbda.berry.edu/items/show/15150.